Victoria Mansion today—inside and out—looks almost exactly the way it did when it was built (1858-1860)—an astounding time machine to take you back to pre-Civil War America. 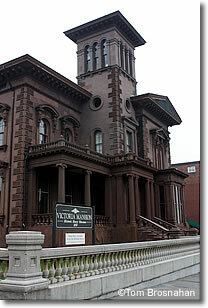 Victoria Mansion is the finest example of Italian villa-style residential design from the pre-Civil War era in America. What's significant about the huge asymmetrical brownstone house with its four-story tower is not just its exterior architecture, but the period authenticity of its intact original interior design and furnishings, of which more than 90% survive: works of art, carpets, gas lighting fixtures, stained glass, even the dinner services of porcelain, silver and glassware. Designed by New Haven CT architect Henry Austin, Victoria Mansion was built between 1858 and 1860 as the Maine summer home of Mr Ruggles Sylvester Morse and Mrs Olive Ring Merrill Morse. The Morses, who had made their money in New Orleans hotels, hired Gustave Herter of New York to design the interiors. This was the first of Herter's projects, and the only one to survive. Herter spared no expense, equipping the house with every modern convenience, including gas lighting, hot and cold running water, central heating, and a servant call system, all cutting-edge comforts in 1858. Lived in by only two families, the Morses and the Libbys, during its century and a half of existence, the house was saved from demolition in 1940 by William H Holmes, who bought it with his own money and later transferred ownership to the Victoria Society of Maine, which now preserves it. Time Machine aptly describes it: step inside, and you're in the Portland of a century and a half ago.